Looks like the Easter Bunny will be a Snowshoe Hare here in the Maine Northwoods! These little eggs are more in sync with our conditions here in the North Maine Woods. It’s hard to think spring with 4 ft. of snow on the ground. It has been a crazy winter! And next week is Easter and we still have snow on the ground! Aah, the joys of living in the North Maine Woods. That sure puts a damper on the annual Easter Egg Hunt as even if the warming trend predicted for the next week takes place, we will be smack dab in the middle of “Mud Season”. So Easter, even though it is in mid-April will be an indoor event this year. We will be focusing on the indoor stuff like decorating Easter Eggs and crafting an indoor Easter Egg Tree. Easter Egg Decorating is a great family tradition to incorporate in to your Easter holiday because it’s a fun activity for the whole family. I never bother to buy those Easter Egg decorating kits. To me, they are a waste of money and they don’t spark the kids imagination and creativity. 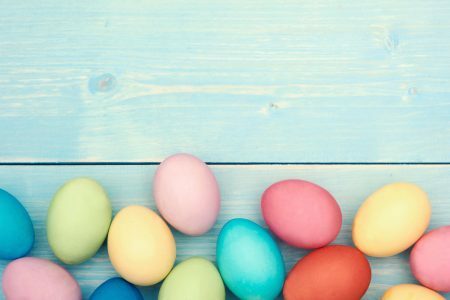 The Easter egg decorating ideas in this article will give your kids some hands on crafting experience. In this digital age, anything that challenges their minds and uses their hands is “a good thing”, as Martha would say. A cheap and easy Easter egg dye is easily made with things you have on hand in the kitchen. Mix 1/2 cup of boiling water with 1/2 teaspoon of white vinegar, add then add a few drops of food coloring to get the color you want. You can mix some really pretty colors. I make striped Easter eggs by wrapping some thin tape around the eggs. Dye them one color, then take the tape of and dunk them in another color. Another way to make cute designs is to take blue painters tape and apply it to wax paper. With scissors cut out shapes like hearts, circles, triangles, etc. Peel the wax paper of the tape and place the blue tape shape onto the egg. Put it in the dye for a few minutes, remove and peel away the tape shape. You can leave as is or put it into another color dye. Toddlers can decorate Easter Eggs,too! The hot liquid and the chance of a spilling disaster might make egg decorating with toddlers seem like a lot of work and worry. My solution is to pick up some Easter holiday stickers ( you can find inexpensive ones at the dollar store) when shopping. These are especially good for toddlers and kindergarteners who don’t have the dexterity for anything to tricky, and they come out looking very pretty to give the kiddos a positive experience. A rainbow of gorgeous colors….from Kool Aid! Check out this KOOL idea from Jen Geigley at the Hey Jan Renee Blog. Dying eggs with Kool Aid! The kids will love this one and it is super safe! These mosaic decorated Easter eggs are gorgeous and provide another use for that craft room essential, Modge Podge! 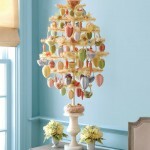 I found these classy and colorful Easter Eggs at Gingerbread Snowflakes blog. 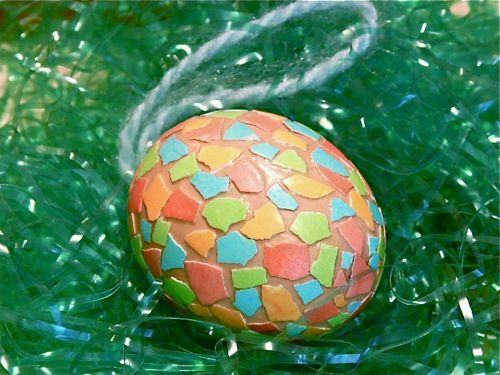 The eggs have a unique mosaic pattern that is created by using dyed, crushed egg shells. Another use for Modge Podge ….got to love that stuff! 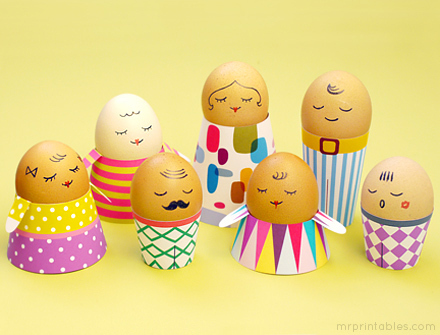 The use of watercolor pencils add a whole new creative dimension to these Easter Eggs. These gorgeous eggs are done with watercolor pencils. The kids could get real creative with their decorating using this technique. 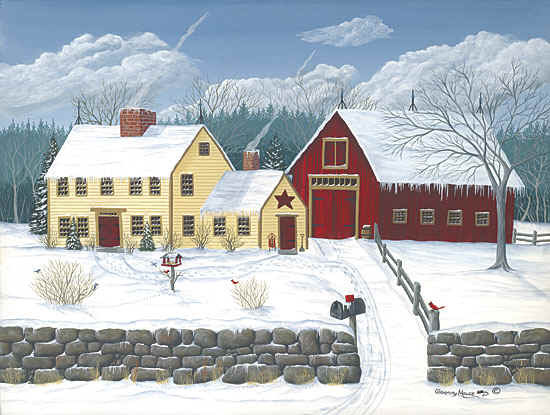 These are the creative product of Alisa Burke at the Lisa Burke – Redefine Creativity Blog. This one would make a great homeschooling lesson. 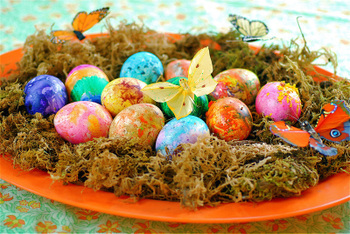 Over at the Reader’s Digest they show how to dye eggs with natural dyes. The colors are soft and subtle with a gentle touch of spring. The possibilities for natural dye Easter Eggs is endless. 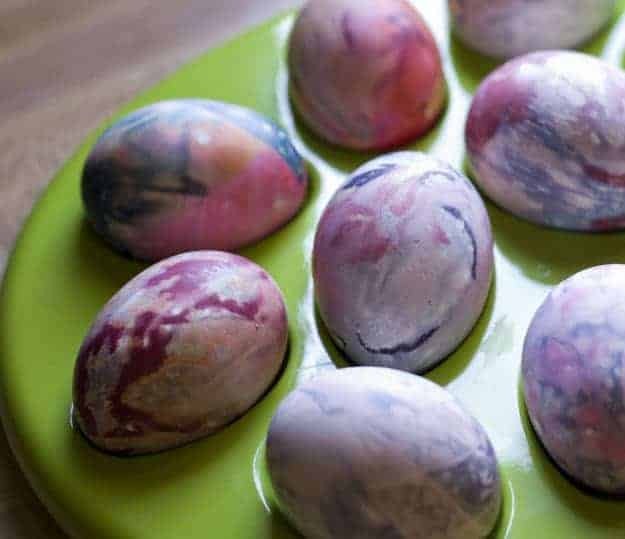 A unique technique gives these Easter Eggs the appearance of being tie-dyed. These eggs are trip down memory lane for this “Old Hippy” . Over at Buns In My Oven blog, you can learn how to tie-dye eggs. How do you tie an egg in a knot? Checkout this post – very cool! Thread Wrapped Easter Eggs – they’re a good thing! Don’t these colors just scream SPRING! 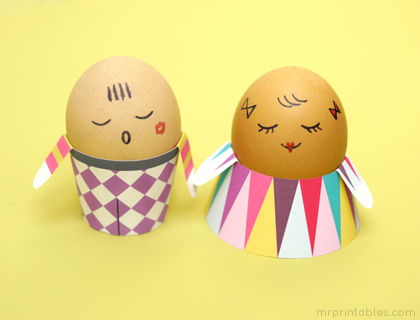 Thread wrapped Easter Eggs are a simple but stunning idea! An easy idea from Martha Stewart.com, these have a home spun look, and will use up those short pieces of thread left on an almost empty spool. You could do the same thing with scraps of yarn. Delicate and elegant, these lacy Easter Eggs by Martha Stewart are easy to replicate. Another “good thing” from Martha Stewart.com, there’s even a video where Martha Stewart shows you how to make these delicately decorated eggs. What a gorgeous plateful of spring colors! These Easter Eggs from the Full Circle blog will brighten any Easter Tablescape. I found these at the Full Circle blog. I love the deep rich colors on these eggs. Made from melted Crayola Crayon wax, they are a project that is best left to older kids with parental supervision. Wouldn’t these make great place card holders for your Easter Tablescape! Easy and fun for the kids to make, try this tutorial from Mr.Printables.com. With free printables, these make adorable decorations that the whole family can enjoy. Wouldn’t they make adorable place card holders for Easter Dinner? These are so darling and the kids will love assembling them. 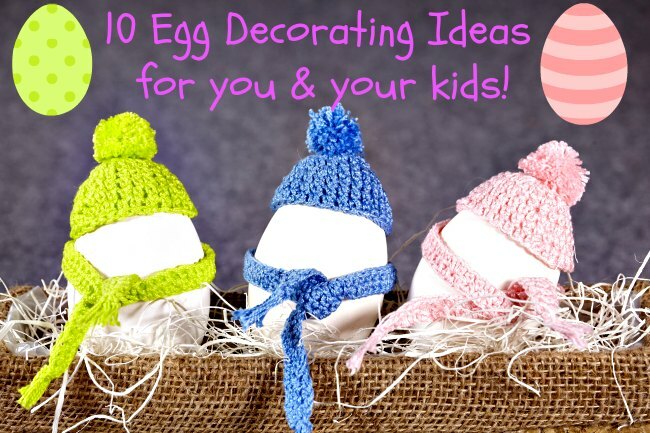 So get out the eggs, gather the kids around, and make decorating Easter eggs a family tradition. Happy Easter, from The Wilderness Wife. 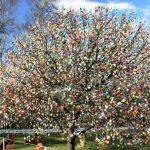 12 Easter Egg Trees To Make with your family! Make an easy Easter Egg Tree! OH! I LOVE the lace ones!!! SO pretty! Thanks so much for taking the time to link up with us over at the #HomeMattersParty – we hope to see you again this Friday! Feel free to bring a friend! Such really cool Easter egg ideas!!! Your sure have me smiling. The Teen eggs will go over big. My fav. were the mosaic ones. I love the mosaic one too! The subtlety of the coloring is so beautiful. Well, thank you very much for the feature and I will be sure to join you! I loved going down memory lane with some of these decorated eggs. How fun and some are truly lovely. Thanks for sharing at Transformed Tuesday. Decorating eggs was so much fun when I was a kid. My sister and I loved doing it! But none of our creations were as inspiring as the ones in the post. Lots of very cute and colorful eggs!! What a great round-up of ideas. Thank you for sharing at Sharing Saturday! Thanks for sharing it on Facebook! Thank you for sharing this round-up of such fun ideas at A New Creation link party. I think my children and I will definitely be trying some of them! What a great collection. I’ll be browsing these for hours! 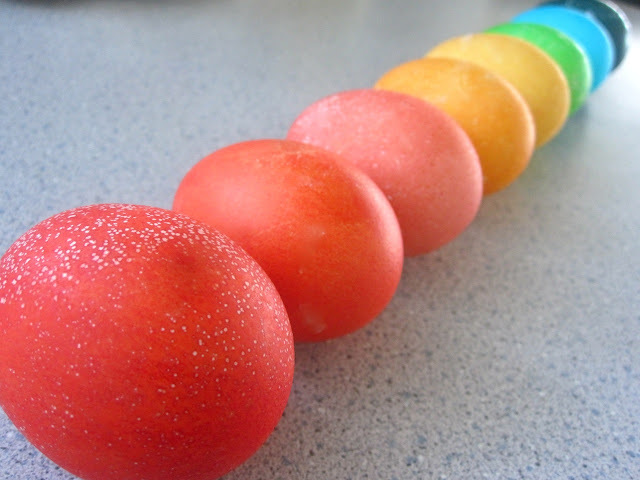 You can also put rubber bands around the eggs before you dye them and then remove the bands after the egg dries. It will leave little stripes …very easy and very quick. I’m going to mention this post in a post I’m doing tonight. I’d also love it if you’d link this at my linky party on Friday. Thank you and I will be there Friday. Thanks for the fun ideas. One year me and my girls did the natural dyed eggs. It was really fun and they turned out very unusual. Thanks for sharing with SYC. Sharing these on my FB page tomorrow! A great selection of Easter Egg decorating! I like the Lace Easter Eggs most 🙂 Thank you for sharing this post at the ALL MY BLOGGY FRIENDS party! Oh my, where to begin? So many cute, cute ideas! Love all these ideas! Left-over egg shells, crayons and lace! I draw faces on my hard-boiled eggs to we’ll know which ones they are in the refrigerator. I love all those ideas. I’ve tried a few of them. I’m kind of a Martha Stewart follower, so I’ve tried many of hers over the years. A couple of years ago, I decoupaged some wooden eggs using mod podge and scrapbook paper. They’re still beautiful. If you were only in southern Maine then you have just touched the tip of the iceberg so venture north and northeast. There is a lot to see. 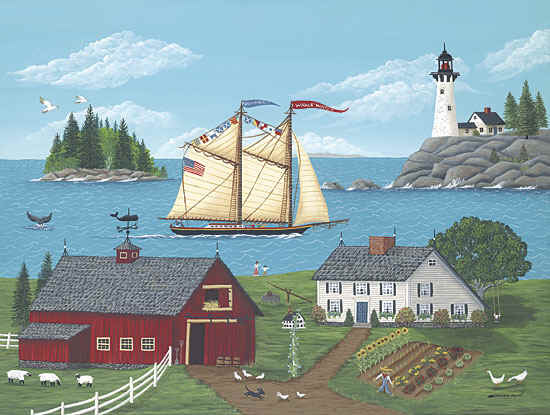 I’ll be posting about different spot in Maine so check my blog on Mondays for more Maine info. And if you are heading to the North Maine Woods, let me know. I could give you a guided tour! Just got excited for Easter looking at your post! So many fun ideas! Thanks so much for sharing at Mom On Timeout! So many cool ideas. My favorite is the watercolor pencil one. I also want to try the natural dyes. Thanks for sharing these at Fabulously Frugal Thursday! Hope to see you next time. I think kids will get a kick out of the Kool-aid one too! Great ideas. I love the watercolor eggs and may try to that this year. So pretty. I love all the pretty Easter eggs, especially the ones with water colors. I didn’t know they made water color pencils! fabulous ideas! plan to pick a couple to do with my granddaughter. Thanks for the list of egg ideas! I will try the tape technique this year. I have toddlers so any activity with eggs needs to be a straightforward one. I have tried it with rubber bands wrapped around the egg and you can make some interesting patterns that way, not as precise but interesting. Such cute ideas!! 🙂 Thanks for joining the Blog Hop! Thanks for the feature! Do you have a “Featured Button” I can put on my blog? I looked on your blog but didn’t see one. You live in Maine? What a beautiful place to live. It’s one of the places I’ve always wanted to visit. I love your header shot. Gorgeous. Wow, these are great ideas! I really love the lace ones and the faberge ones are so cute and sparkly too. Thank you so much for linking up to “Making Your Home Sing Monday” today! 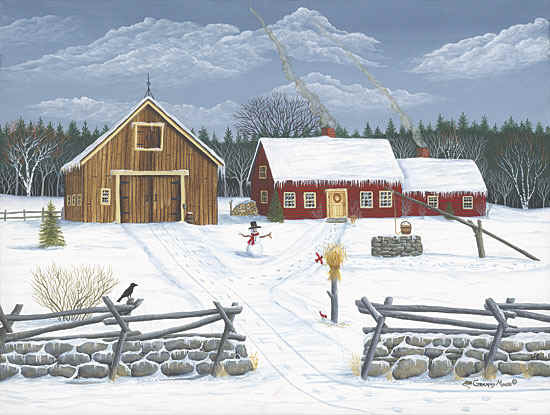 That picture in my header is the view from our front porch. We did the unconventional thing and turned the back of our house toward the road and the front toward beautiful Mount Katahdin. Our house is so far off the road ( 1400 ft) and buffeted by trees that it doesn’t make that much of a difference. That view is different every day and we get some spectacular sunsets! Such a wonderful round up! I have placed this on my easter board as well! Thanks for Sharing at Show Me Your Plaid Monday’s! I still decorate eggs but without the grands these days. They are all grown and but just happened to realize they might like to come by and do it for nostalgia’s sake. Some great ideas here. Over from The Grand Social. Since I have two soft boiled eggs each morning, I wash them and color the shell and fill them with a little green and some jelly beans. I use acrylics but think I will try the mosaic this year. Great post. How beautiful and inspiring! I will have to try some of the great techniques you have shared with us. Can’t wait for Easter! Each have their own beautiful simplicity – thanks for sharing! There are some very interesting techniques and the variance of color is what fascinated me form the subtlety of the natural dyes to the jewel like brilliance of the Kool Aid. Wow! Thank you so much for including my mosaic egg tutorial in this group! After all the egg decorating techniques i have tried these past few years, the mosaic eggs are still my favorites! They are absolutely gorgeous and I hope you get lots of people coming to your site to see all the wonderful crafts you do! I can’t wait to dye Easter eggs with my little one. I loved doing it when I was growing up! Those eggs looks so wonderful. 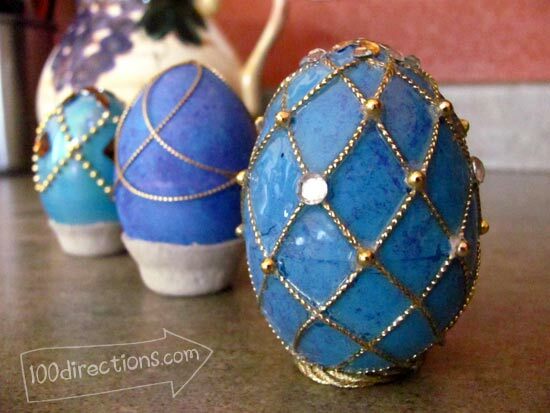 The faux Faberge eggs look so fantastic and I love the natural dye and the lace eggs !! It’s hard to pick a favorite, isn’t it! I love surfing around the web to look for ideas to do with my grand-kids, and after all that work it seems right to share it with others. What great ideas! Thanks for sharing them. How cute! And perfect for sparking fun grandparent and grandkids activities. Thank you. Hi there, I found you over at the Get Schooled Link party. What a great collection of egg decorating you’ve come up with! I’ve gone and pinned some of them. Thanks so much for taking the time to gather them and share them with the rest of us. 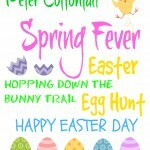 You gathered a wonderful collection of ways to decorate Easter eggs. I will have to give some of them a try. Love the Martha Stewart ‘delicate’ styled ones. So many great ideas! Love it!!! I love this! I’d like to invite you to link up on Saturday Spotlight @ Angels Homestead today. I’ll be featuring Easter treats and crafts soon, and would love to include this in the collection. Really fun post. I love painting Easter eggs, we blow them so we can have a collection. Love this post, I haven’t colored eggs in years. 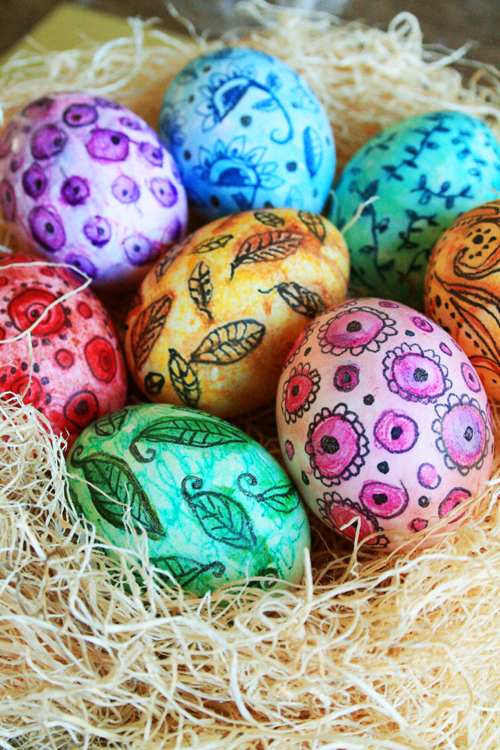 I think I’ll have to do that this year… love the low cost coloring solution and the naturally dyed eggs. Love these ideas! Thanks for sharing! All of these are stunning. Thanks for sharing. I love all of these ideas! So cute!